Open your web browser and click on the OneDrive for Business icon in your Office 365 portal. Right-click the document for which you want to restore an earlier version, and then click Version History. 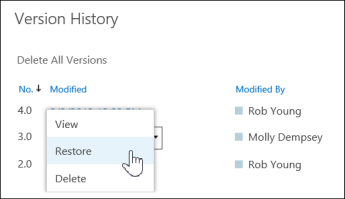 In the Version History dialog box, select the arrow next to the version of the document that you want to restore, and then click Restore. In the confirmation message, click OK. The document version you selected becomes the current version. The previous current version becomes the previous version in the list. If you don’t have a Version History option, you will need to enable this option with the instructions from Microsoft here. If this article helped you, please share it on LinkedIn because it may also help your friends.